An 85-year-old man presented with a 3-week history of headache, reduced mobility and dysphasia. The headache was unilateral affecting the left side. His reduced mobility was associated with varying levels of weakness of the right arm and leg. His dysphasia was reflected in problems reading the newspaper, and speaking to his wife, as well as understanding what his wife was saying to him. On examination he was found to be alert and orientated in time, place and person, scoring an abbreviated mental test score of 9/10. Neurological examination revealed a right upper motor lesion of cranial nerve VII, increased reflexes in the right arm and leg, and a dysphasia which was both expressive and receptive. In addition he had a temperature of 37.5°C. He had a normal full blood count, routine biochemistry and chest X-ray. Blood cultures were negative. His C-reactive protein was 11 mg/l. Urgent computed tomography (CT) of the brain was organised (figure 1). Following treatment the patient's condition improved gradually over a month. At discharge he had minimal dysphasia and walked independently with ease. Two months later he developed a peripheral sensory neuropathy of a glove and stocking distribution. Serum vitamin B12, folate and thyroid function tests were normal. There was no history of alcoholism, diabetes mellitus or a connective tissue disorder. Following a further adjustment to his treatment he eventually fully recovered (figure2). Might the medical history help? What is the probable initial diagnosis? How would you manage his problem? Why did he develop peripheral neuropathy? 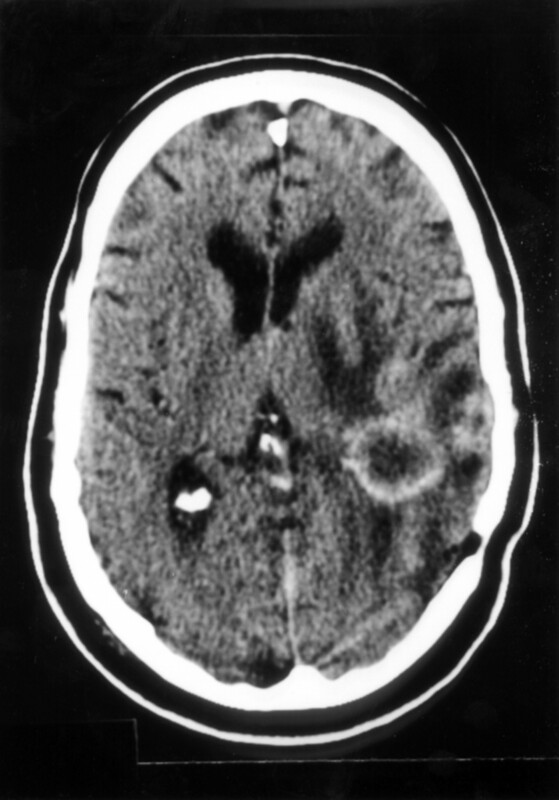 Cranial CT scan showed ring-enhancing lesions in the left temporo-parietal area suggestive of cerebral abscesses or possibly metastatic malignant deposits (figure 1). The clinical picture supported the former diagnosis. Cerebral abscesses, followed by peripheral neuropathy as a side-effect of metronidazole treatment. 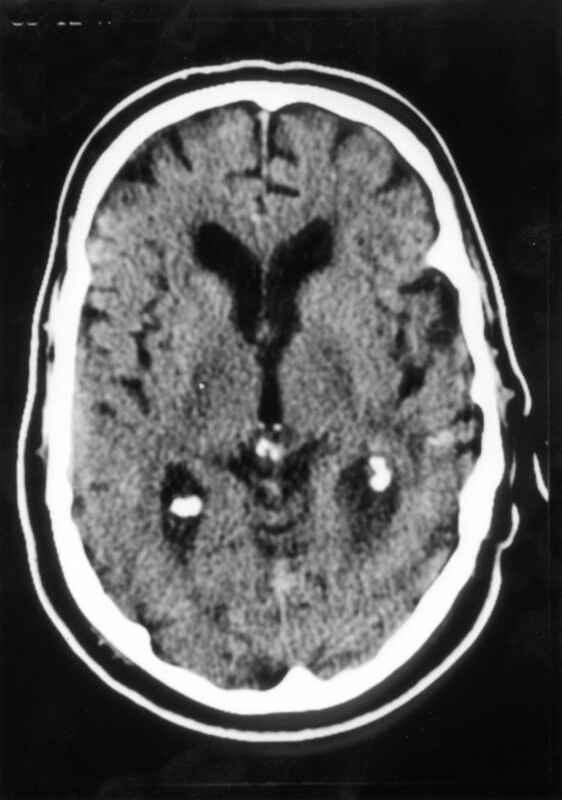 (1991) Brain abscess. Infections of the central nervous system (Raven Press, New York), 1st edn. p 463. (1995) Brain Abscess. Mandel's principle and practice of infectious diseases (Churchill-Livingstone, USA), 4th edn. p 889. (1977) Bacteriologic study of otogenic cerebral abscesses: chemotherapeutic role of metronidazole. BMJ 2:991–993. (1993) Treatment of brain abscess with cefotaxime and metronidazole: prospective study on 15 consecutive patients. Clin Infect Dis 17:857–863. (1995) Non typhoid salmonella subdural empyema in a patient with acquired immune deficiency syndrome. Scand J Infect Dis 2:173–174. (1976) Metronidazole neuropathy. J Neurol Neurosurg Psychiatry 39:403–405. (1994) Peripheral neuropathy induced by metronidazole. Ann Pharmacother 28:536.